Transitioning cats is always a tricky situation. Have you ever seen the “Shell Game” on The Price is Right? Well, that’s what I often equate the transition of a new food to for some felines. You have to offer them several “shells” until you guess which one has the hidden ball or magic food option. Like the players of this game, I find that many times cat owners give up before they find the shell with the hidden ball. But when it comes to improving our felines’ health, making the transition from kibble to raw food is definitely worth the effort. Switching your cat to a raw diet can be much easier said than done. Cats can be finicky eaters for a variety of reasons. Cats often have a texture issue with food. Sometimes they even get addicted to the carbs and other fillers of dry kibble food, which also makes it more difficult to make the switch. With super picky cats, it helps if you offer food to them in several different ways and allow them to choose what they like best. It is also a good idea to offer several meal options and let them gravitate towards one, which then gives you the chance to manipulate the formula going forward for a more likely scenario of them switching foods. If I had the magical solution to get every cat to change, I would be a millionaire. What I do know is that most often the cat owner is the main component of the cat’s reluctance to switch, or even try, a new food. I often tell cat owners to go home and literally have an out loud conversation with their cat. Even though our feline friends don’t talk back, they certainly hear our voices and our messages loud and clear. After some blank stares and a few deer in headlight looks, the owners often return to the store to tell me that they followed through with this activity and that their cats have attempted the new food offered. I once heard from a feline veterinarian something that describes cats perfectly: “You can tell dogs what to do, but cats, you have to ask them nicely”. This has stuck with me because it is so true! A few simple tricks that we have found to work with upgrading a cat’s diet is to begin with canned food. It is always easier to start the transition with something they especially enjoy. Some cats won’t even change from a crappy, grocery store can of food to a high-end can of cat food. With these cats, it’s easy to mix the bad with the good until you can completely switch to the good one. Once you have made this transition you can begin to add small amounts of a raw diet to the canned food to upgrade to a premium raw diet. Some cats will never eat more than half canned and half raw diet. There isn’t anything wrong with this way of feeding. Continue to have an open mind about your cat’s likes and dislikes. Some raw is better than no raw. With some cats this transition takes a few weeks. For others it can take months, even years, to get to this point. Each animal will be different and their accomplishments of switching may take some time. You, as the owner, can do nothing more than be patient and diligent with making the switch. Remember, you are doing it to improve your pet’s overall health, well-being and longevity. Another trick for a raw diet with cats besides mixing it with canned food is allowing it to warm up to room temperature before feeding. 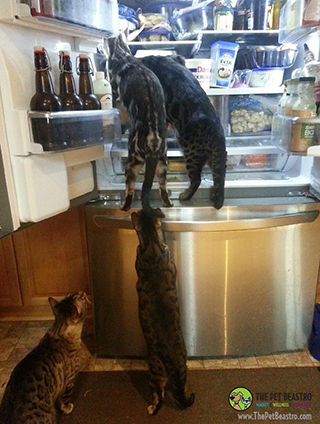 Some cats don’t care for the coldness of the food. You may also want to try different proteins. Don’t forget about the red meat options! There are many feline fanciers out there that disagree with feeding red meat since our domestic cats wouldn’t catch and take down large animals in the wild. However, many of our domestic felines have 96% of the DNA of their African big cat ancestors that would actually hunt these red meat animals. In fact, my own cats prefer beef, pork, lamb and venison over turkey or pheasant any day of the week. Don’t be so close-minded that you don’t allow your feline friend to make a transition to a premium raw diet. After all, cats’ digestive tracts are biologically set up for meat, not overly processed kibble. Getting your cat on a regular feeding schedule can also work towards your benefit. Free feeding isn’t the best way to feed your cat. Cats in the wild hunt all day long, which means they eat several small meals throughout the day instead of gorging on two large meals. While dogs do much better with a fast and gorge type meal behavior, cats do not. If you can play with your cat 20-30 minutes before meal time, this will also make their meal offering much more satisfying. The play before eating releases hormones that mimic what would happen in the wild if they were on a hunt for their food. Note that if you have multiple felines, they should all have their own place setting and eating space away from the other cats. As you begin to transition your cat to a raw diet, be sure that you’re feeding them the right amount. An average 10-12 pound cat should be consuming approximately 250 calories daily. With a raw diet, this is equivalent to 6 ounces of food. The daily calorie total includes all food (canned, raw, freeze dried) AND treats. We often forget about all the calories that we give our pets throughout the day in the form of treats but even those can contribute to obesity. Obviously if your cat is smaller or larger than average, you will need to adjust the calories to their weight. Kittens and pregnant Queens will need more food that the suggested average calories. There are many raw food options to help with your cat’s transition. Maybe your cat is addicted to carbs and refuses to give up kibble. In that case, switching to a better dry food would be your first step in the right direction. Then you can begin to add canned food and start to reduce the amount of kibble. From there, you can begin to add raw food. If you are a go-getter and your cat isn’t finicky, you may just want to take the plunge and jump straight into raw. Why waste any time, right? I find the Rad Cat is an easy switch for most cats because it has the texture and consistency of a canned food. At The Pet Beastro, we offer free Trial Packs of Primal Raw Pet Food. 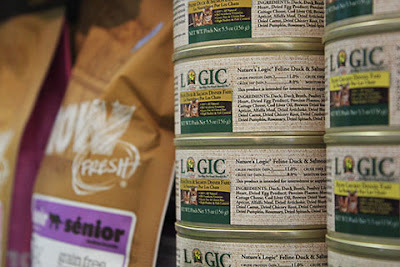 We also typically have samples of many other brands such as Nature’s Logic and Steve’s Real Food. When feeding multiple cats raw, Nature’s Logic and Steve’s Real Food are more cost effective since you can purchase them in large packages and they also offer frequent buyer’s programs. Last but not least, you can always make your own raw food recipe. This does take a bit more time and skill as well as balance to make sure that the diet has all the vitamins and minerals needed to avoid deficiencies. Cats are definitely different creatures than dogs in many ways. But they are smart and talented. 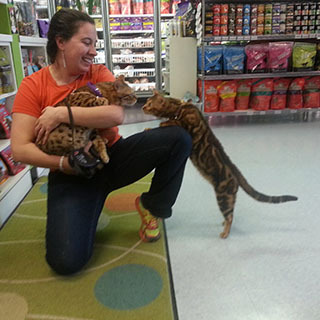 We can even teach felines tricks and clicker training, just like their canine friends. The key to working with your cat is to have an open mind. We can get them to change their foods and habits when we, the owners, change our habits and eliminate negativity about their likes and dislikes. 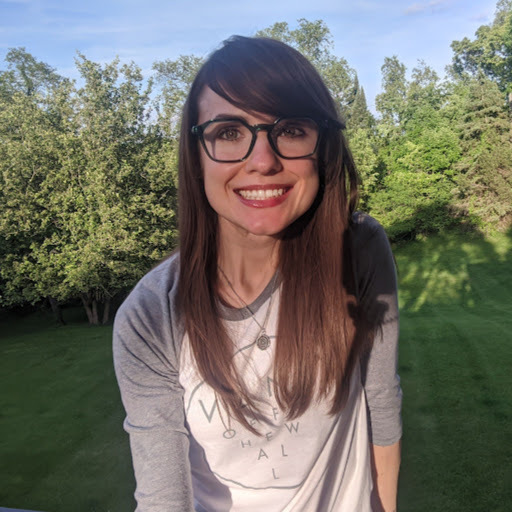 Jill Tack is a certified Natural Health Practitioner from the Naturopathic Institute of Therapies and Education and is working toward becoming a Naturopathic Doctor in 2015. 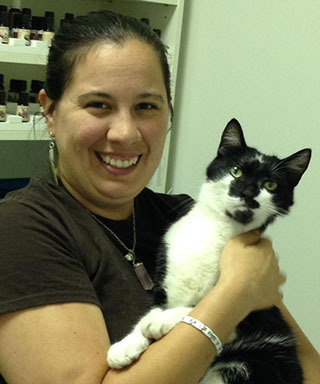 She founded The Pet Beastro in 2003 to help people learn why alternative pet food options are better for pets. 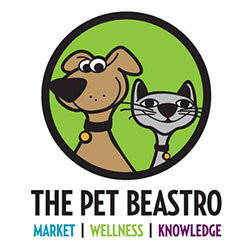 The Pet Beastro prides itself in offering the largest selection of raw pet food in Metro Detroit. They also sell dehydrated, organic and natural food, treats and supplements for dogs and cats through their store and online market. In addition to its alternative pet products, The Pet Beastro offers one-on-one counseling and group seminars to help provide pet owners with the knowledge they need to improve their pets’ well-being. Keep up with the store’s events and natural pet product specials by following them on Instagram and Facebook.